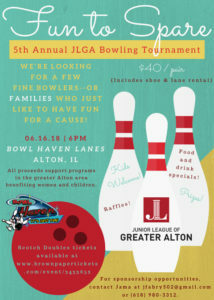 Our annual JLGA Bowling Tournament will be held June 1, 2019 at Bowl Haven Lanes. Stay tuned for more details! Thank You for Supporting Fun to Spare 2018! JLGA is grateful to all of our attendees and generous sponsors for their contributions to a great cause. The 5th annual Bowling Fundraiser raised proceeds to benefit programs in the greater Alton area benefiting women and children.